125 posts categorized "2005 Bankruptcy Amendments (BAPCPA)"
All Late-Filed Taxes Now Nondischargeable?! Sometimes a tax return is not a tax return. As a result, bankruptcy is becoming a less effective response to back tax woes in the US. Yesterday, the 1st Circuit joined the 5th and 10th in holding that old income tax debts are nondischargeable if the taxpayer-debtor filed the related tax returns late. This is the latest negative impact of BAPCPA and an oddly worded statute with an even odder citation. Section 523(a)(1)(A) of the Bankruptcy Code has long made nondischargeable recent income tax debts, for taxes for which the return was due within three years before the bankruptcy filing. But older tax debts might also survive the discharge thanks to section 523(A)(1)(B)(i). That section renders taxes nondischargeable if the taxpayer-debtor failed to file a return. Not surprising. What is surprising is a recent revision and its expansive interpretation, which have created a vast new category of nondischargeable tax debts. A few weeks ago, I posted about an apparent movement to challenge the bankruptcy-exempt status of IRAs based on boilerplate language commonly found in the account agreements of many of the nation's largest brokerages. The legal argument rested on hyper-technical interpretations of the Bankruptcy Code and the account agreements, but nonetheless several lower courts had ruled that debtors could lose their IRAs to the bankruptcy trustee. The Sixth Circuit heard oral arguments on the case last Thursday and issued an opinion yesterday. The court rejected the bankruptcy trustee's arguments and ruled the IRAs remained exempt despite language that hypothetically could have led to the brokerage having a lien on the account. And, yes, for you keeping score at home that is four days total, including a weekend, from oral argument to published opinion. Some chapter 7 trustees have found a problem that could affect thousands of IRAs, leading to the first post in a two-post series on unintended consequences. A better reading of the law is that these IRAs should remain exempt from the bankruptcy process. Cases are wending their way through the court system, and until the courts resolve the issues, many IRAs may remain under threat. And, there is no guarantee the courts will agree with me on how the cases should be resolved. The situation begins with the 2005 changes to the bankruptcy law. One of the few ways these changes were favorable to consumer debtors was to clarify and expand the exemptions available to retirement assets, including IRAs. Most retirement assets are exempt from the bankruptcy process, meaning debtors can retain these assets even after the bankruptcy case. Sometimes we forget that, with all its flaws, consumer bankruptcy is still a remarkable institution, providing meaningful relief to more than two million Americans a year (counting co-debtors and dependents). The system’s singular feature is that most individuals can find a private attorney to represent them at a relatively low flat fee, typically worth it in light of the benefits of a bankruptcy discharge to most debtors. In other areas of consumer law, it is much harder for individuals to find a private attorney. Despite changes in bankruptcy law in 2005 that increased the cost of access to the system, the consumer debtor bar has figured out how to deliver services for reasonable fees. If the need to appeal arises, however, the affordability equation often breaks down, a problem made worse by the wretched drafting of the 2005 law, creating hundreds of difficult new legal issues. A debtor in bankruptcy may have a good legal case on appeal but no way to pay a private attorney for the expense of researching and writing a brief and preparing for oral argument. An appeal adds thousands of dollars of additional cost. The National Consumer Bankruptcy Rights Center was formed to address this problem, helping to protect debtors’ rights as well as the integrity of the consumer bankruptcy system by making sure that cogent arguments are made at the appellate level. NCBRC (pronounced Nic-Bric) provides assistance by either working directly with debtors’ attorneys or by filing amicus (friend of the court) briefs in courts throughout the country. Anyone interested in consumer bankruptcy law should find NCBRC’s web site, www.ncbrc.org, useful as a resource, both for its bank of briefs and its blog about important consumer cases. Jialan Wang has a blog post up summarizing her and her co-authors very interesting NBER paper estimating that at least 30,000 to 60,000 liquidity constrained households this will be priced out of bankruptcy because of the increased costs that came with the 2005 changes to the bankruptcy law. Actually, the research does not find that tax rebates lead to bankruptcy filings -- that was just a cheesy trick to get you to read the post. The researchers find that, after receiving tax rebates, people are more likely to file bankruptcy as they now have funds they can use to pay for the bankruptcy fees. They then use the randomization of the delivery of tax rebates in 2001 and 2008 to identify the effect that the higher fees caused on the bankruptcy rates of liquidity constrained households. It is a clever research design, and Credit Slips readers will want to check it out. The article discussed in the N.Y. Times story today is heavily empirical. It is also deliberately light on the prescriptive. Bob Lawless, Dov Cohen and I did make two modest proposals: (1) that a question about race of the debtor should be included on the form for a bankruptcy petition to make it possible to confirm (or disprove) the finding that African Americans file in chapter 13 at a much higher rate than debtors of other races (about double in the data we have), and (2) that all actors in the bankruptcy system—judges, trustees, attorneys and clients—be educated about the apparent racial disparity and the possibility that subtle racial bias may be producing it. The Times certainly helped with the second one! Beyond that, we leave it to others and to each of us individually to come up with policy responses. In my view, Henry Hildebrand, a longtime chapter 13 trustee in Tennessee, got the big picture exactly right; he is quoted in the Times story as saying we should “use this study as an indication that we should be attempting to fix what has become a complex, expensive, unproductive system.” He will probably reappraise his views if he finds out that I agree with him! Those of us who participate in or study the system know that its complexity is onerous. Lanning and Ransom are the Supreme Court's two recent decisions on the interpretations of the means test added to the Bankruptcy Code by BAPCPA. Courts are actively puzzling out how to apply these decisions, which generated as many questions as they answered (Lanning, in particular). I recently learned that the Bankruptcy Rules Committee is planning to propose a new version of the means test form, B22, to accommodate Lanning and Ransom. The revised form would have a line that required debtors to list changes in circumstances and provide details. I'm troubled by these potential revisions because I think it is an unduly aggressive interpretation of the two decisions to create an affirmative duty by debtors, and their counsel, to disclose changes in income or expenses, above and beyond what is already required by the Bankruptcy Code. Last Friday, the U.S. Court of Appeals for the Sixth Circuit released an opinion in a case called Carroll v. Baud. The decision, which generally ended badly for the consumer bankruptcy filers involved in the case, involved technical interpretive issues caused by the drafting mess that was the 2005 bankruptcy law. What caught my eye were not the holdings themselves, but the way the court got there. After an extensive analysis finding that the plain language of the statute could support a result either for the debtor or the creditor, the court came up with its own statutory tie-breaker: in doubtful cases, rule for the creditor. The Sixth Circuit explained, "Where each competing interpretation of a Code provision amended by BAPCPA is consistent with the plain language of the statute, we must, as the Supreme Court did in Lanning and Ransom, apply the interpretation that has the best chance of fulfilling BAPCPA’s purpose of maximizing creditor recoveries." This statement is hardly a passing fancy of the court. It repeats the point in several places, including an extensive analysis of the idea in several pages in the middle of the opinion. The court puts its thumb on the scale for haves instead of have-notes. Its reasoning is simply outrageous, not least of all because the Supreme Court cases it cited do not support its result. Yesterday, the Supreme Court decided Ransom v. FIA Card Services (née MBNA Bank). The issue was whether, to determine the amount of income available to pay creditors, a debtor could deduct hypothetical car payments on a car he already owned. That would seem to be result Congress directed in the 2005 bankruptcy amendments, but the Supreme Court disagreed. We already have blogged about the case a lot (here, here, here, and here). Rather, there seems to have developed a sense among the lower courts that what Congress intended to do was jam it to the debtor good and hard, and that if Congress get it right the first time, then we must help them. Bankruptcy lawyers have fashioned a new canon of statutory interpretation: if the statute seems to favor the creditor, apply the statute; if it seems to favor the debtor, assume it's a mistake and favor the creditor anyway. Exactly. I agree with every single word Buce writes (with one exception), and I can't write as well as him. Go read the post. The one tangential point where I disagree with Buce is that he should give Justice Thurgood Marshall more credit. Justice Marshall wrote some great bankruptcy opinions because his law practice often involved the problems of everyday persons, an experience that most every other Supreme Court justice lacks. On December 23, President Obama signed a bill that made technical corrections to the Bankruptcy Code. As the term "technical corrections" suggests, this is a topic of interest probably only to the bankruptcy geeks in the crowd. The bill was not intended to make any substantive changes but only to correct drafting mistakes from the 2005 changes to the bankruptcy law. It only took five years and even the technical corrections are too few for a horribly drafted law. Maybe there is a nugget for the persons who have a more general interest in bankruptcy. In addition to being a huge policy mistake, the 2005 law created a lot of problems for lawyers and judges because of its poor drafting. As a service to our readers, here is a copy of the enrolled bill. The public law version is not available as of this writing. Tara Siegel Bernard has a post up over at the New York Times Bucks blog about economic indicators, outstanding credit, and bankruptcy filings. She quoted some guy named "Lawless" who really sounds like he knows what he is talking about--probably a good-looking guy too. Punch line -- less credit means fewer bankruptcies all other things being equal (which they rarely are). During this past week in Bankruptcy with Bob, otherwise known as my bankruptcy course, we covered the means test. As my students now know, the means test is the screen that the U.S. Congress put on chapter 7 back in 2005. If you're below the state median income for a household of your size, you can file chapter 7. If you're above median income, the means test starts with your gross income and takes a series of deductions based on IRS guidelines to determine your disposable income. If your disposable income meets certain thresholds, meaning you can afford to pay back unsecured creditors some part of what you owe, you must file chapter 13. There are exceptions and more details, but that description works as a general matter. The Executive Office of U.S. Trustee (EOUST) helps keep track of the numbers to plug into the test, but in one particular way, it has taken a legal position on a contested issue without making clear its position is contested. For the past several years, we have watched various industries struggle, including the automotive, airline and entertainment industries. Although troubled companies within these industries have their own unique issues, they also share common experiences relating to the recent recession, competition and product/technology obsolescence. Recessions and in turn bankruptcy often are said to facilitate creative destruction, but I actually like a phrase recently used by Chrysler’s CEO, Sergio Marchionne, "creative reconstruction." U.S. bankruptcy laws—in particular, chapter 11—give companies an opportunity to recreate themselves. In this sense, creative reconstruction might be a more apt phrase for the utility of chapter 11 (see my previous post on that topic here). A company can use the chapter 11 tool not only to reorganize its capital structure but also to streamline or transform its operations (e.g., eliminating outdated product lines or technologies). In those instances, the protection of the automatic stay, the flexibility of the executory contract and lease provisions and the time granted companies to reorganize are critical. It is here that the 2005 amendments to the U.S. Bankruptcy Code arguably weakened the utility of chapter 11 for many companies. Rather than rehash the issues created by the 2005 amendments, I would like to focus on the potential for creative reconstruction in chapter 11. And I would like to do so by reflecting on the recent experiences of Movie Gallery and Blockbuster. Both companies incurred significant debt as the result of M&A activity during 2004 and 2005 (see, e.g., here for Movie Gallery and here for Blockbuster). Both companies faced increased competition from new technologies and new market entrants (Netflix, Redbox, etc.). And now only one company remains, but it too is on the verge of extinction. First, I want to thank Bob Lawless and the other authors of Credit Slips for inviting me to guest blog this week. I am honored to share this space with you, and I look forward to a robust dialogue. Second, I have to say that guest blogging at Credit Slips feels like coming home to me. Before changing careers, I had the privilege of serving as a law clerk to the Honorable William T. Bodoh, and I practiced as an associate and then a partner in Jones Day’s corporate restructuring practice group for about ten years. I welcome this opportunity to share my passion for everything bankruptcy with others interested in the field. As you might suspect from my days in practice, I am a strong proponent of the utility of chapter 11 of the U.S. Bankruptcy Code as a restructuring tool. I want to emphasize that I view chapter 11 as a "tool"—not a "fix"—in the context of financial distress. The effectiveness of this tool depends largely on who is using it and how it is being used. Companies do not fail because of chapter 11; rather, companies fail because, among other things, they wait too long to invoke the chapter 11 tool (see here), they do not understand how best to use that tool (see here), or perhaps they simply have outlived their economic utility (see here). The effectiveness, however, also depends on the construction of the tool itself. So how do we assess its construction? Although there are a number of very useful studies on the topic, I suggest we look back at the origins of chapter 11 and three of its important features: its dual goals of rehabilitation and value maximization (referenced recently here in Congressional testimony); its design to mitigate the collective action problem (see here at pp. 95-98 for an interesting discussion); and its ability to promote negotiation and consensual resolution. The dual goals of rehabilitation and value maximization require transparency and information sharing to all, and by all, key constituents. The collective action problem merits strong rules maintaining the status quo while constituencies gather around the negotiating table. And negotiation needs a flexible framework and a neutral third party with the discretion and power to adapt the rules to the particular needs of the case. Does chapter 11 currently measure up? Over the years, chapter 11 has increasingly moved away from its original objectives and, in many respects, been captured by special interest groups. This shift has created weaker rules and less flexibility. It also has limited the contributions of our specialized and very talented bankruptcy bench. During my time at Credit Slips, I hope to explore the strengths and weaknesses of chapter 11 in its current state, including its role in facilitating obsolescence (see here), creating value and exploiting information asymmetries (see generally here and here). Chapter 11 has changed and perhaps not all for the best. I suggest that we might best move it forward by looking backward. The Supreme Court has just issued its opinion in Hamilton v. Lanning, a case interpreting the "means test" that the 2005 bankruptcy amendments added to chapter 13. The issue was chapter 13's requirement that the debtor commit his or her "projected disposable income" to a plan, and whether projected disposable income should be determined in a mechanical way (based on the debtor's income for the past six months as defined in the means test) or whether projected disposable income should include reliance on some estimate of the debtor's income in the future during the plan period. The Supreme Court rejected the mechanical approach, which was argued for by the debtor trustee and the National Association of Consumer Bankruptcy Attorneys, and adopted the forward-looking approach. The decision, authored by Justice Alito, was 8-1, with a dissent by Justice Scalia arguing the plain meaning of the text supported the mechanical approach. I'm certain there will be loads of technical commentary forthcoming on this case, debating whether the Supreme Court's interpretation of the statute was correct. I have some non-technical observations. First, it isn't clear that debtors are "hurt" or "helped" by this decision in terms of what they will be required to pay. Some debtors will have incomes that have picked up right on the eve of filing, so their forward-looking income is higher. But other debtors will have earned more in the past six months, filing in an income trough with bleak prospects. We could empirically test which system is better, but of course, to the best of my knowledge, nobody did this. (Query whether such data would have been persuasive to the Court if it had existed). Second, I am quite sure this decision hurts debtors. How can I reconcile that with my first observation? Because it's not just the law that matters. In many contexts, including this one, the cost of the law will determine the justice received. The mechanical approach is easier to apply and is less likely to spawn litigation, which consumers filing bankruptcy can ill afford. Faced with a choice of filing a plan that is likely to begin a lawsuit, some consumers will just give up and drop out of chapter 13 or not bother to file at all. By holding that "only in 'unusual' cases, a court may go further and take into account other 'known or virtually certain information' about the debtor's future income or expenses," the Court will add a layer of complexity to lawyers' and debtors' decisionmaking in chapter 13. And legal decisions don't come free. Can You Deduct an Expense for a Car You Own? The news came today that the Supreme Court has granted cert in Ransom v. MBNA Bank. The issue is whether the Bankruptcy Code means what it says. OK, I'm giving away what I think is the right answer. The question is whether an above-median income chapter 13 debtor, in calculating "projected disposable income," can deduct an ownership expense for a car even if the debtor owns the car free and clear such that the debtor is not making an debt or lease payments on the car. The Fifth and Seventh Circuits said the plain meaning of the statute clearly allowed the debtor to do so. The Ninth Circuit said the statutory language directed a different result. If you're wondering how so many federal judges can differ over the "plain meaning" of a statute, you're obviously not a lawyer. According to a story in this morning's BNA Bankruptcy Law Reporter, the Congressional Research Service (CRS) released a study stating the 2005 amendments to the bankruptcy law (the Bankruptcy Abuse Prevention and Consumer Protection Act or BAPCPA) will not permanently reduce the U.S. bankruptcy filing rate. Those findings fit with what we have been seeing the past few months. Even on a per capita basis, the March 2010 bankruptcy filing rate matched the rate from before the 2005 amendments. CRS reports are not publicly released as a matter of course, and the Bankruptcy Law Reporter is a subscription service. Hence, I can't link you anywhere for this information. If someone does have a copy of the CRS report, I will be happy to make it available here through Credit Slips and/or pass it along to Open CRS. This morning, the Supreme Court issued its decision in Milavetz on prebankruptcy attorney-client counseling and bankruptcy attorney disclosures. I've got to get to a meeting so I don't have time for an extended post. The early reporting has been technically correct but misleading, e.g., Reuters, "US top court upholds lawyer bankruptcy advice law." The decision upheld the law but construed its most troubling provision--section 526(a)(4)--in a very narrow way, eliminating almost all concerns about the statute. It appears to come out about the way I expected. This just in from our Washington, DC, bureau: the Supreme Court has granted certiorari in Hamilton v. Lanning, No. 08-3009 (10th Cir. Nov. 13, 2008), where the Tenth Circuit adopted the "forward-looking test" for how much a chapter 13 debtor has to pay creditors. The alternative is the "mechanical test" adopted by the Ninth Circuit in an often-discussed and often-criticized decision called Kagenveama. The forward-looking test allows for a more flexible consideration of the debtor's circumstances in the future. The mechanical test, as the name implies, requires only the application of the amounts fixed in the statute. As the Tenth Circuit said, reasonable people could read the Bankruptcy Code to reach either result. The forward-looking test can account for changed circumstances of the debtor, such as a decline in income that often precedes a bankruptcy filing. Of the four bankruptcy cases the Supreme Court has on its docket right now, Hamilton may have the greatest practical effect on real people. It will not only determine the rules for those who file chapter 13 but, as a result, also play a big role in whether chapter 13 will be a good solution for many persons with financial problems, especially homeowners facing foreclosure. Controversy abounds these days about whether government programs should adjust downward to reflect cost-of-living and income declines. I’d like to stir up a little controversy here at Credit Slips about Bob Lawless’ recent post that said the drop in median state income will "make it harder to file bankruptcy." First, I don’t quite follow the logic of the concern. Even if the income cut-off drops, "median" still means that half of all people are below the number. I would expect those considering bankruptcy to occupy the same places in the distribution of incomes in their state, regardless of median income fluctuations. So, it seems to me then that the fraction of potential bankruptcy debtors with above-median income would remain constant, even if the median income drops. The legal standard isn't changing, so I don't think it is fair to call the change in median income a "tightening" of the bankruptcy law. Second, even if bankruptcy filers don’t experience the general decline in income of the state’s entire population, the effect of a change in median income on bankruptcy eligibility is likely to be very, very small. Bob admits the change won't affect "a lot" of people but also says it won't be "a few." I think it really will be just a few. Why? Because the fraction of those made ineligible because of the means test is really tiny, and so even over an anticipated 1.5 million bankruptcy cases in 2009, we are looking at a minute change when we talk about adjusting the operation of the means test. In 2008, only 10% of chapter 7 debtors had above-median incomes. And nearly all of that 10% passed the means test once expenses are deducted. According to its report, the U.S. Trustee filed a motion to dismiss for abuse in 2,881 Chapter 7 cases--that works out to 4% of all above-median cases and .4% of all chapter 7 cases. Those numbers are hard to square with any fear that there will be any measurable change in the fraction of people made ineligible for chapter 7 this year. Importantly, these numbers don’t reflect how the very existence of a median income test may discourage people from filing a bankruptcy case or may push people directly to chapter 13 rather than risking an abuse determination. But again, that effect—whatever its magnitude—probably won’t change with median income fluctuation. Beginning on November 1, some people might suddenly find they are now ineligible for chapter 7 bankruptcy. Making it harder to file bankruptcy in the middle of our financial crisis may not be the best policy idea to come down the pike, but it is exactly what Congress set in motion in 2005. Here is why. Yes, self-serving, but What Is To Be Done? A few years ago, my Michigan Law colleague Jim White (J.J. White to some) -- who has guest blogged for Credit Slips -- and I picked up a BAPCPA case trickling though the Ninth Circuit. (OK, I started it and then bugged him about it.) We got together and wrote a brief to file as amici and sent it off dutifully to CA9 back in 2007. Then we forgot about it (even missed oral argument). Until yesterday, that is, when we saw that the Ninth Circuit handed down the decision reversing the bankruptcy and district court judgements that had so exercised us. Here's the link: Greene v. Savage (In re Greene) (9th Cir. Oct. 2, 2009). Summary follows the break. Some other obligations have kept me away from blogging for the past few weeks. One great thing about a group blog is having great colleagues who pick up the slack. I had wanted to say a few words about the Supreme Court's June 8 decision to hear United States v. Milavetz. At this point, the Court's announcement is old news. This post is about what is at stake in the Milavetz decision and why Credit Slips readers might want to watch this case when it gets argued in the fall. There have been several Credit Slips posts (here and here) about the lower court decisions in Milavetz. Some issues that were raised in the lower court decisions have dropped away, and before the Supreme Court, the case will involve section 526(a)(4) of the Bankruptcy Code, a provision added by the 2005 amendments. It provides that "a debt relief agency shall not advise an assisted person or prospective assisted person to incur more debt in contemplation of such person filing a case under this title or to pay an attorney or bankruptcy petition preparer fee or charge for charge for services performed as part of preparing for or representing a debtor in a case under this title." Yes, that is language that perhaps only a lawyer could love but probably not even then. The upshot is that section 526(a)(4) aims to prohibit bankruptcy lawyers from advising clients to incur debt right before they file bankruptcy. It was not intended to prohibit bankruptcy lawyers from charging for their services, although that might be a natural reading of the language. Rather, the section also tries to prohibit lawyers from advising clients to borrow money to pay attorneys' fees for a bankruptcy filing. The 2005 changes to the U.S. bankruptcy law were supposed to move more debtors into chapter 13 with the idea that they would have to pay at least a portion of their debts. In March, however, the chapter 13 rate dipped below the old chapter 13 filing rate. Not only do these latest figures suggest the 2005 law is not working as its supporters promised but also that the latest spikes in bankruptcy filing rates are from persons in the most desperate financial conditions. Of the noncommercial petitions filed in March 2009, only 25.5% were chapter 13 cases. These data come from Automated Access to Court Electronic Records (AACER), which defines a "commercial" case as one that involves a corporation, limited liability company, or similar entity, one with an employer identification number (EIN) (instead of or in addition to a Social Security number), or one with a designation such as "doing business as" (d/b/a). All other cases are noncommercial cases. From 2001-2004, the Administrative Office of U.S. Courts (AO) reported that 29.3% of nonbusiness cases were chapter 13s. "Nonbusiness" is not the same as "noncommercial." AACER uses a better, more comprehensive definition to calculate "noncommercial" cases, but if we look at all bankruptcy cases together, the numbers don't change much. The AO reports 28.7% of all cases as a chapter 13 from 2001-2004, and 25.0% of all cases in the AACER data during March 2009 were chapter 13s. We've already seen a lot of bs numbers in the cramdown debate. The Mortgage Bankers Association keeps pushing its ridiculous figures. And now Todd Zywicki has joined the fray with an op-ed in the Wall Street Journal a couple of weeks ago. Professor Zywicki that claimed that "A recent staff report by the Federal Reserve Bank of New York estimated a 265 basis-point reduction on average in auto loan terms as a result of the reform." One little problem. That's not what the Fed staff report found. Professor Zywicki was off by 250 basis points (a doozy of a mistake! ), as well inserting a causal link not supported (and arguably contradicted) by the Fed staff's study. The study states that "The decline in the average auto loan spread was 15 basis points lower after BAR for unlimited exemption states, a 5.7 percent decline relative to the mean over all states (265 basis points)." In other words, the average rate spread is 265 bp. The decline in rates, to which Zywicki was referring was only 15bp, and that was only in states with an unlimited homestead exemption. That it was not 265 bp was abundantly clear from the regression tables. But that's not all. It's not as if Professor Zywicki simply mistook a 15 bp drop for a 265 bp drop. That 15 bp isn't what it appears to be. The study used two statistical specifications and looked at states with limited and states with unlimited homestead exemption to see what impact there was on auto loan rates post-BAPCPA, which enacted an anti-auto cramdown provision (the infamous "hanging paragraph" that says that there's no bifurcation of claims for cars purchased primarily for personal use in the previous 910 days). In one specification it found nothing with statistical significance regardless of the homestead exemption level, which means that it couldn't rule out the possibility that the change in rates was random. In the other specification, post-BAPCPA there was a marginally statistically significant 15 bp drop in five-year auto loan rates in states with unlimited homestead exemptions. There was no statistical significance in the drop in other states. What's funny about this is that homestead exemptions have no bearing in Chapter 13--exemptions are only available in Chapter 7. So if the study had aggregated all states for its regression, it seems unlikely that it would have gotten stronger statistical significance. So we have at best very weak evidence of a 15bp drop in rates. But it doesn't follow that the drop was due to the anti-auto-cramdown provision. The study also found a significant decline in auto-loan delinquencies in the short period after BAPCPA. The most plausible story, I think, is that surge in bankruptcy filings before BAPCPA's effective date cleared out the pipeline of troubled loans so that post-BAPCPA auto loan default rates were lower. My guess is that they've climbed right back up. Notice that this has nothing to do with cramdown. This has to do with moving forward some filings that would have happened later. So we have a 15bp drop that might not even be statistically significant and only in some specifications and only for states with unlimited homestead exemptions, and it probably isn't attributable (or at least most of it) to the anti-cramdown provision, but instead to BAPCPA causing a filing pile-up. So where did Professor Zywicki get this 265 basis point number from? That's the spread that exists between five year auto loans and five year Treasuries. It has nothing to do with bankruptcy. Sometimes a little common sense is needed when looking at numbers, too. In December 2005, auto loan rates were at around 6.63% (663 bp). If 265 bp was right, it would have been a 40% decrease in auto loan rates! Whatever impact bankruptcy has on credit costs, I don't think there's anyone who could honestly argue that 40% of the cost of auto loans is due to the ability to cram down loans on cars purchased primarily for personal use within the previous 910-days with a purchase money security interest. There just aren't that many folks filing for Chapter 13 bankruptcy, much less who fit into this particular set of circumstances, to have this kind of impact on pricing, regardless of the loss severities. Yet another case of baloney numbers shaping the bankruptcy debate. I hope the WSJ runs a correction on this. Now there's some fact-checking for you. First, I misread the study too. The 15bp finding is in a regression that measure the "difference-in-differences" in the spread between auto loans and Treasuries pre- and post-BAPCPA for states with and without unlimited homestead exemptions. The study does not report the post-BAPCPA rate drop in auto loan rates. The author, however, tells me that it turns out to be 46-56 bps, and to have strong statistical significance. So let the record stand corrected on this. Second, regardless of whether the number is 15, 46, 56, or 265bps, the finding of a correlation does not mean there's causation. But that's precisely what Professor Zywicki was pushing in the WSJ. Unfortunately, it's just not a tenable claim. It's possible that BAPCPA resulted in lower auto loan rates. But in order to make a reasonable causation argument, one must first explain the similar or larger rate drops in 2000-2001 and in 2003 and in 2007 that have nothing to do with BAPCPA. Otherwise, the causal argument is reduced to the fallacious post hoc ergo propter hoc variety. The chart below, taken from the NY Fed study shows with the solid and dotted lines the spread between auto loan rates and Treasury's for states with and states without unlimited homestead exemptions. They move in sync, and they clearly fall after BAPCPA. But they also fall equally sharply before and after BAPCPA. Auto loan rate spreads over Treasury jump around a lot, and the mere fact that they fell after BAPCPA doesn't prove anything. The problems with Professor Zywicki's causality argument don't end there. Any causality argument must also distinguish between general impacts of BAPCPA (e.g, delinquency pipeline cleared out) and the auto-cramdown provision. This type of event study cannot provide support for that. The rate drop could be due to the hanging paragraph, but there's no responsible way to make that claim without addressing these other factors, and the NY Fed study doesn't attempt to do that. The fact that Professor Zywicki was off by 209-219 bps, rather than by a full 250 bps (something he couldn't have known from the study) doesn't absolve him of making an untenable causal claim. The United States Court of Appeals for the Eighth Circuit just ruled on a matter of first impression among circuit courts--the constitutionality of the treating attorneys as "debt relief agencies" under provisions of the 2005 Bankruptcy Abuse Prevention and Creditors' Consumers' Protection Act. (Freudian slip...) In so doing, the 8th Circuit struck down a major BAPCPA provision that inartfully restricts attorneys' ability to give clients advice about how to prepare their finances in contemplation of filing for bankruptcy. The cost of everything keeps rising, even the cost of going broke. When something costs more, people use less of it. I've been thinking lately about that idea and how it relates to the U.S. bankruptcy filing rate. The filing fee for a chapter 7 bankruptcy is now $299, which is a 43% increase from the cost just before the 2005 changes to the bankruptcy law took effect. Chapter 13 filing fees are now $274, a 41% increase from 2005. Those increases would help to explain why U.S. bankruptcy filings remain at historically lower levels. For example, I project that there will be slightly over 1.0 million filings in the 2009 calendar year as compared to about 1.6 million filings in the years immediately preceding the 2005 bankruptcy law. 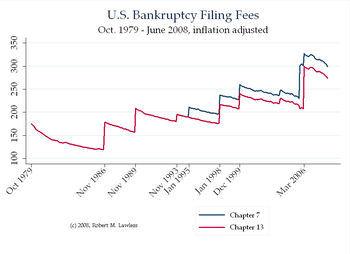 I recently had occasion to compile the rising cost of chapter 7 or 13 filing fees since the Bankruptcy Code's became law in 1979. Sure, attorneys' fees are the big cost of filing bankruptcy, and with one of my great research assistants, Heather Miller, I'm working on a paper that quantifies how the 2005 bankruptcy law changed the total cost of filing. (Heather probably would be more pleased if I worked on the draft instead of blog posts.) As part of that work, I felt compelled to see how one component of the cost of bankruptcy, filing fees, had changed and felt even more compelled to share it with all you.